This paper investigates the general situation of e-government usage of the Turkey. The monthly reports of Social Security Institution E Government Gateway of Turkey were published for the years of 2012, 2013 and 2014. In this paper, these data are used as an indicator of e-government usage of Turkey. Basic time series graphs are used in the analysis. The results show that there is no trend in the series. The series move mostly by changes in rules and regulations governing SSI after related news coverage on the media and this could be called as the â€œcuriosity effectâ€. At last, seasonality of the series was investigated and the seasonal graphs show that generally variables have the lowest level in June. Erginbay Ugurlu, Suleyman Acikalin. "E-Government Usage in Turkey: An Analysis of the Social Security Institution." 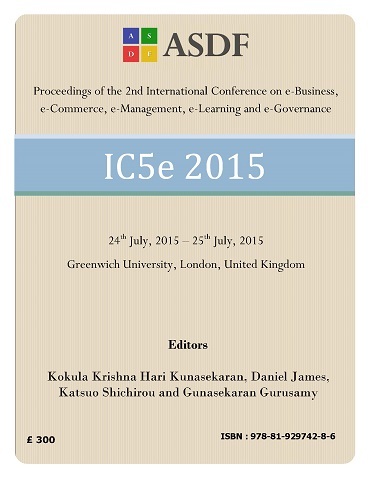 International Conference on eBusiness, eCommerce, eManagement, eLearning and eGovernance (2015): 117-121. Print.